GOP 2016 hopefuls on Obamacare decision: Mike Huckabee calls it an act of judicial tyranny. The Supreme Court on Thursday rejected a major challenge to Obamacare, ruling that federal subsidies can be given to individuals who live in states that did not set up their own health care exchanges. Chief Justice John Roberts and Justice Anthony Kennedy joined the court’s liberal wing in the 6-3 decision in King v. Buwell. If the court would have sided with the plaintiffs, as many as 6.4 million people could have lost their federal aid since they live in states that opted against creating their own insurance marketplaces and instead rely on the federal exchange at healthcare.gov. 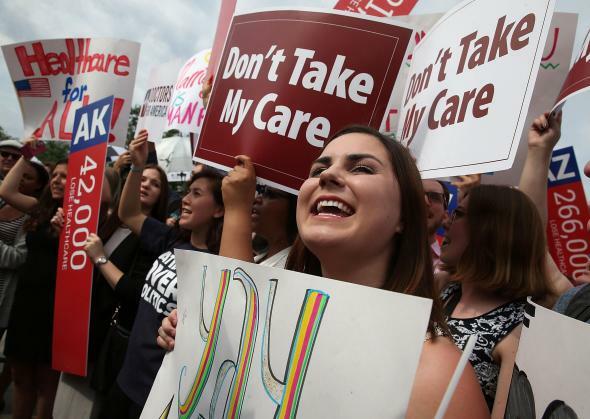 Republicans, meanwhile, were hoping that such a ruling would have opened the door for them to achieve what has been their chief legislative goal since the Affordable Healthcare Act was signed into law five years ago: Repealing Obamacare. Exactly how they were going to do that—and exactly what they would replace it with—remains unclear. I disagree with the Court’s ruling and believe they have once again erred in trying to correct the mistakes made by President Obama… and Congress in forcing ObamaCare on the American people. Despite the Court’s decision, ObamaCare is still a bad law that is having a negative impact on our country and on millions of Americans. I remain committed to repealing this bad law and replacing it… with my consumer-centered plan that puts patients and families back in control of their health care decisions. We need Consumer Care, not ObamaCare. Today’s King v. Burwell decision, which protects and expands ObamaCare, is an out-of-control act of judicial tyranny. Our Founding Fathers didn’t create a “do-over” provision in our Constitution that allows unelected, Supreme Court justices the power to circumvent Congress and rewrite bad laws. The Supreme Court cannot legislate from the bench, ignore the Constitution, and pass a multi-trillion dollar “fix” to ObamaCare simply because Congress misread what the states would actually do. The architects and authors of ObamaCare were intentional in the way they wrote the law. The courts have no constitutional authority to rescue Congress from creating bad law. The solution is for Congress to admit they screwed up, repeal the “nightmare of ObamaCare”, and let states road-test real health care reforms. This decision turns common language on its head. Now leaders must turn our attention to making the case that ObamaCare must be replaced. The Obama Administration has ignored the text of the Affordable Care Act time and again, and today’s ruling allows them to continue to disregard the letter of the law. While I disagree with the ruling, it was never up to the Supreme Court to save us from Obamacare. We need leadership in the White House that recognizes the folly of having to pass a bill to know what’s in it. We need leadership that understands a heavy-handed, one-size-fits-all policy does nothing to help health outcomes for Americans. It is outrageous that the Supreme Court once again rewrote ObamaCare to save this deeply flawed law despite the plain text and in the face of overwhelming evidence that the law is not working for the majority of Americans. … The lasting solution here is what we’ve been saying all along. We need to repeal ObamaCare. It hasn’t worked. We need to do the one thing we’ve never tried in our healthcare system—real competition. We know that competition provides lower prices and higher quality. But instead of a free market, healthcare so far has been a regulated oligopoly. We used to regulate insurance companies in all 50 states and now, we’ve nationalized that process. All Americans agreed with President Obama’s goals of quality, affordable care, but that is not what we got. Those on the other side of the aisle, meanwhile, were slightly more enthused by the decision. The Supreme Court recognized the common-sense reading of the ACA. Access to affordable health care shouldn't depend on where you live. This post was updated to add additional responses as they became available. A haunting animation of the 315-year, 20,528-voyage transatlantic slave trade. Why we’re talking about Confederate flags instead of gun control. Marriage equality will have unintended consequences. Here are the ones to worry about.